HomeVolume 7Issue 1Horrorism and Ontological Dignity: What Do/not Historical Signs Tell Us? In the aftermath of 9/11, we have been bombarded by violent images of death, destruction, and terror. After the war in Afghanistan and the rise of ISIS, it has become common to view beheadings or other brutal acts during the evening news. While this rhetoric of violence is more ubiquitous, we often mistakenly refer to acts of horror as acts of terror. While terrorism and horrorism are overlapping ideas, horrorism, a neologism created by Italian philosopher Adriana Cavarero, is distinct from terrorism in that it is a violation of an individual’s ontological dignity. We can clarify Cavarero’s definition of ontological dignity in two ways. First, Hannah Arendt argues in The Human Condition that human beings are unique as we expose ourselves to others and “consign our singularity” (Cavarero 20). Second, as a result of exposing ourselves to others in our daily lives, as unique beings, we are inherently vulnerable. Ontological dignity is composed of both our uniqueness and our vulnerability; thus, our ontological dignity opens us up to be wounded or to be cared for. Horrorism is an act of extreme wounding, and is possible because we expose ourselves to others as we live our lives. Because horrorism is an unfamiliar term, it is helpful to think of it in relation to a more familiar concept—terrorism. To understand the difference between terrorism and horrorism, Adriana Cavarero examines the etymology of both words. Where terror refers to fear, the act of trembling, and panic; horror, on the other hand, denotes dismemberment, cold, frozenness, and the feeling of hair-raising (Cavarero 4, 7). In many ways, too, the distinction between terrorism and horrorism comes down to intention: if someone kills another individual because they are a potential threat to others, it is possible that such an event is an act of terror1. However, horrorism lacks any concern for other people and views them merely as material. In the case of ISIS beheading videos, Cavarero would argue that a staged beheading is an act of terror. While such an event is disturbing and abhorrent, the victims’ identities are usually known or released. They’re being beheaded for a reason, and though their faces aren’t seen, their identity matters. On the other hand, random mass beheadings are an example of horrorism because, in that situation, the victims’ identities do not matter, and they are simply bodies. According to Cavarero, horror is an offense against the ontological dignity of the individual person; it is an offense against who I am, the face, the material body. While Cavarero’s argument about horrorism centers around human subjects and the loss of ontological dignity, I propose a wider context for horrorism that includes actants, both human and nonhuman subjects. In particular, I am interested in material spaces as actants. As I define horrorism through the lens of spaces and places, I pull Cavarero’s scholarship into the field of Rhetoric and Composition as well. To develop this idea of place-placed horrorism, I first draw from classical rhetoric and examine how Plato discussed place in Phaedrus and Timaeus. From there, I pull from E.V. Walter, who contends that different spaces contain different feelings, or what he calls “expressive space” (9). Walter argues that spaces echo the “passions, myths, fantasies . . . [as well as] the biographies and local histories, and the drama of dwelling together” (9). I would argue, therefore, if spaces have human qualities, then a space can experience a violation of ontological dignity just as an individual can. While modernity creates binaries between living and nonliving things, as Laurie Gries maintains, “New materialists reject such dualism, arguing that any bifurcation of humans and things, culture and nature, object and subject fails to acknowledge the ontological hybridity that constitutes reality” (5). In the light of Gries’s contention that we disrupt these distinctions, we can, in fact, broaden Cavarero’s definition of horrorism to include both human and non-human subjects. In doing so, we can study how spaces experience horrorism. In what follows, I expand Cavarero’s reading of ontological dignity to include nonhuman subjects and use a small, Southern town—Pendleton, South Carolina—as a case study. Specifically, I will center my study on the town’s official marker, which demonstrates what Walter calls an “expressive space.” This historical signage deflects from events that the town does not want to discuss: namely, the enslavement of African Americans, the fact that the land originally belonged to the Cherokee nation, and that two plantation houses are now used as tourist destinations. The town’s official marker is a wound—in the center of the town—and demonstrates how a space can experience horrorism as it adopts a rhetoric of deflection to detract from its uncomfortable 226-year-old history. There are three components that frame my discussion about horrorism and ontological dignity: First, I will explore the notion of vulnerability via Judith Butler and Cavarero. Second, I will briefly revisit Plato’s Phaedrus and Timaeus to contend that places have human qualities, and, finally, through Walter and Gries, will ultimately argue for the ontology of nonhuman subjects—specifically with regard to ontological dignity and historical signage. In Precarious Life, Judith Butler’s depiction of vulnerability is a reflection of materiality and corporeality after 9/11. Butler proposes that we are corporeal beings and that our performance takes place by means of our corporeality. One of the aspects of our corporeality is our vulnerability, and it is this notion of vulnerability that Cavarero relates to horrorism. To be vulnerable, for Cavarero, means that we are open to wounding and to caring, and she argues that the extreme in wounding is horrorism (24). Care has the capacity to restore ontological dignity through material means; care is not remembering a person through a eulogy but the act of being present or there for someone. To care requires action, which can be as simple as putting an arm around someone. Cavarero’s word picture to convey the material act of care is that of an injured woman after the 2005 London bombings and the first aid workers who were able to restore ontological dignity through their care (18-19). My research extends Cavarero’s work and asks: How is the historical signage in Pendleton an example of extreme wounding? How might Pendleton restore the ontological dignity of the town through revising the signage to include non-normative histories? Before I can delve into these questions, though, I need to consider ontology vis-à-vis nonhuman subjects. Although philosophy has traditionally defined ontology in relation to living beings, other scholars2 argue that non-living things exist independently from living beings. As E.V. Walter explains, “A thing has an objective reality, a person has a subjective reality, a human relationship is a social reality, and a place is its own kind, which may be called a topistic reality” (118). Walter contends that in Phaedrus, “Plato dramatizes the power of places to move the soul” as he connects the expressive energy of a place with the power of love (146). Socrates and Phaedrus frequently discuss the physicality of their emotions, where they currently stand, and where they are going—in a material sense. The location of their conversation is vital to their dialogue, as they move from inside the city walls to outside the city, near the River Ilissus.This move outside the city walls points to the chora, an idea that Plato expands on in Timaeus. The chora is first of all a place that is other. In the chora, emotions and ideas can emerge that are not tied to the kinds of codes that we operate in because it is outside the city walls that constrain us. Although Socrates mentions place various times in his dialogue with Phaedrus, early in the text, he interrupts his own speech because he is divinely inspired. We observe this inspiration by way of a song, but Socrates is quick to point out that his inspiration does not come from the Muses but from his surroundings, or topos (Walter 147). For Plato, the place where Socrates and Phaedrus stand is alive with divine power. We could even maintain that along with Socrates and Phaedrus, the physical space by the River Ilissus is another character in the narrative. Like Socrates and Phaedrus, the space both evokes and emits emotion; it inspires, affects, and moves individuals. The space is alive and can be evaluated as such. Put another way, non-human spaces can experience and exude human characteristics. Walter’s “topistics,” or “the study of placeways,” is an important component of this discussion of place and horrorism. Walter disputes the idea that we can study urban crisis without studying the city itself (5). Although he does not say out rightly that places have ontological dignity, he does make several contentions that complement this theory. It is important that we distinguish between uniqueness and ontological dignity, though. While uniqueness is a characteristic of ontological dignity, uniqueness and ontological dignity are not synonymous ideas. For Walter, places represent a unified connection with human and non-human subjects, so we cannot think about place without recognizing how it is constituted by both human and non-human influences. Places are alive with memories and histories and carry with them the ontological dignity of humanity as well. As I am most interested in the historical signage around Pendleton and will focus on the town’s official marker, Laurie Gries’s work with new materialism and the Obama Hope image is relevant as well. She argues that nonhuman subjects, like the Obama Hope image, should be studied as an “actant” in a rhetorical network and draws from Bruno Latour’s actor-network theory and Jenny Edbauer Rice’s work with rhetorical ecologies. In her study of the Obama Hope image and a variety of its iterations, Gries contends that we “attend to the ways things are composed, produced, distributed, and transformed as well as the ways they induce assemblage, spark collective action, and catalyze change that registers on affective and rhetorical dimensions” (20). While Walter focuses more on the significance of spaces, Gries’s research centers around material objects. Both, though, maintain the ontology of non-living things and spaces. My work with the historical signage and spaces in Pendleton is influenced by both Gries’s and Walter’s research, and, along with them, I propose that all manner of nonhuman spaces and subjects have rhetorical power and should be studied as such. Fig. 1: Pendleton Village Green marker. Pendleton, South Carolina, a small town in rural South Carolina, just celebrated its 226-year anniversary. Along the northern edge of the Village Green is a marker that depicts a brief history of how the town of Pendleton was formed. Fig. 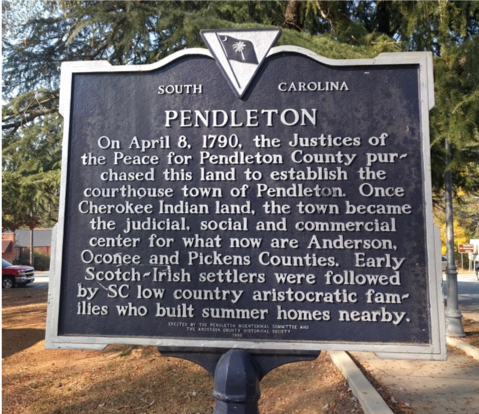 1 portrays this account, created by the Pendleton Bicentenniel Committee and The Anderson County Historical Society in 1990: the town was formed in 1790 by Scotch-Irish settlers, but then the area was propogated by wealthy families from the low country who sought to beat the summer heat in the upstate. These aristocrats built “summer homes,” some of which include Woodburn, Ashtabula, and Fort Hill—all plantation houses with hundreds of African Americans working as slaves. All things considered, the sign uses a rhetoric of deflection to depict a sanitized history that avoids referring to slavery as a direct corallary of the aristocratic families’s lifestyle. It was the Cherokee’s choice to side with Great Britain during the war for independence, and two months of fighting in the summer of 1776 between the Patriot militia and the Cherokees, aided by Loyalists, brought Indian defeat. Crops were destroyed, towns were burned and the Cherokees gave up, ceding their land to South Carolina. Clearly, the blame is placed firmly with the Cherokees, who “chose” to side with the British during the Revolutionary War. Although it is true that the Cherokees were caught on the “wrong” side of the war, the history that Pendleton shares does not even grapple with these difficult questions: Why was the land “up for sale” when it belonged to the indigenous people living here for hundreds of years before white men came? How many Cherokees were murdered before, during, and after Pendleton became a town? Both the sign’s brief reference to the Cherokee Indians and the town’s elaboration on the story use the same rhetoric of deflection that attempts to erase the memories of slavery and the murder of countless Cherokee Indians. If we recall the way that Cavarero distinguishes between terrorism and horrorism, horrorism is a loss of ontological dignity and an act of extreme wounding that erases the individuality of humanity. Pendleton’s official marker is such a wound. In the way the marker glosses over the slaughter of Cherokee Indians and the enslavement of African Americans, it wounds by attempting to erase these histories from public memory. In my discussion about the sign and surrounding space, I have pondered how this place has ontological dignity, but I have also argued that the signs create a rhetorical absence through the narratives that are effaced. While I do not propose that the signage is simply a denial of the ontological character of the surrounding spaces, I do assert that the signs create an ontological impression that we experience as a result of the rhetorical absences in the narrative. For example, the sign that recounts the founding of Pendleton and only offers a fleeting reference to the Cherokee nation produces a dissonant ontological experience. The sign documents a dominant, white-centric history of Pendleton, but if we consider this narrative alongside the indigenous narrative, it is apparent that one history is portrayed and another is dismissed. While the historical marker is a material reminder of the space that surrounds it, the sign also testifies to absences: the absences of historical accounts, the absences of buildings that have been burned down or simply do not exist any longer, and the absences of individuals who have lived and died. The sign does not tell us about racial injustices, about sharecroppers, about the fight for equality—a fight that continues to this day. They gloss over the role that indigenous people play in the town’s chora and reify the white man’s history. As Cavarero explains, caring is the counterpoint to wounding. How might Pendleton demonstrate the kind of restorative care that could bring healing to its spaces? If it is the rhetorical absences in the narratives that are the problem, then a possible solution would include a re/thinking of how the town memorializes its histories. A new town marker would go a long way to manifest that Pendleton is not a town characterized by one history but by many equally significant and meaningful histories. More can be said here—as is always the case. Pendleton is not the only town with troubling historical markers; likewise, there are other signs and spaces that can and should be examined to prevent further violations of placed-based ontological dignity. Arendt, Hannah. The Human Condition. U of Chicago P, 1958. Barnett, Scot. “Chiasms: Pathos, Phenomenology, and Object-Oriented Rhetorics.” Enculturation, vol. 20, 23 Nov. 2015, enculturation.net/chiasms-pathos-phenomenology. Accessed 1 Dec. 2016. Cavarero, Adriana. For More Than One Voice: Toward a Philosophy of Vocal Expression. Stanford UP, 2005. —. Horrorism. Columbia UP, 2007. —. Relating Narratives. Routledge, 1997. Gries, Laurie. Still Life with Rhetoric. Utah State UP, 2015. “History.” Pendleton, South Carolina: History, Hospitality, and Happenings, 2015. townofpendleton.org/history/. Accessed 18 Nov. 2016. Plato. Phaedrus. Penguin Classics, 2005. Rivers, Nathaniel. “Tracing the Missing Masses: Vibrancy, Symmetry, and Public Rhetoric Pedagogy.” Enculturation, vol. 17, 17 Mar. 2014, enculturation.net/missingmasses. Accessed 29 Nov. 2016. “Sterling High School 1896-1970.” Greenville, South Carolina Historical Schools List, 2014. sciway3.net/greenville-historical-schools/SCIwaySterling.htm. Accessed 18 Nov. 2016. —. Timaeus. Penguin Classics, 2008. United Nations General Assembly. “Measures to Eliminate International Terrorism.” www.un.org/documents/ga/res/49/a49r060.htm. Accessed 24 Mar. 2017. Walter, E.V. Placeways. The U of North Carolina P, 1988. 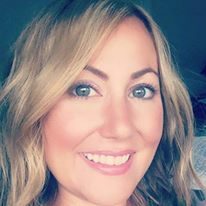 April L. O’Brien (aprilobrien.net) is a PhD candidate in Clemson University’s Rhetorics, Communication, and Information Design program. Her current research studies chora as the conduit between space/place rhetorics and electracy and uses the historic spaces in Pendleton, South Carolina as a case study. Her work has appeared in journals such as Textshop Experiments, Journal for Cultural and Religious Theory, Itineration, and Afterimage. She tweets @april_rhetor.